And no, the plate isn't upside down. It's an opotical illusion. I shouldn't point this out, but blade steak is on sale at the local Superstore this week. Why not, you ask? Because you may get there and take the last package ahead of me. At the price they are asking this week I want more (for my freezer). Tarragon is one of the four "fines herbes" of French cooking, and is most often used in chicken, lasagna, fish and egg dishes. Fresh, bruised sprigs are also steeped in vinegar to make tarragon vinegar. It is also available commercially and has a wide variety of uses. Tarragon is also a good companion plant for your flower or vegetable garden as many common pests dislike its smell and taste thus staying away from your other plants. Béarnaise is considered a "child" sauce of hollandaise, which means it is based on that sauce as are several other "siblings." Hollandaise itself is one of the five French "haute cuisine" sauces. Béarnaise differs in flavourings only—essentially tarragon versus lemon. Being such an important and useful sauce it really should be one you know how to make. 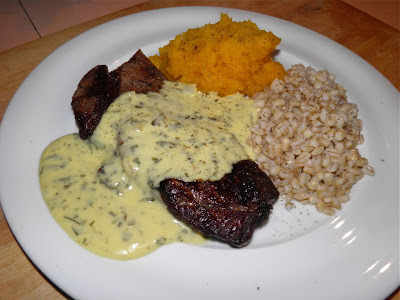 Some sites avow that béarnaise is a nightmare to master, but I find the opposite is true. It is actually very easy to make if you follow the directions. It's not rocket science. 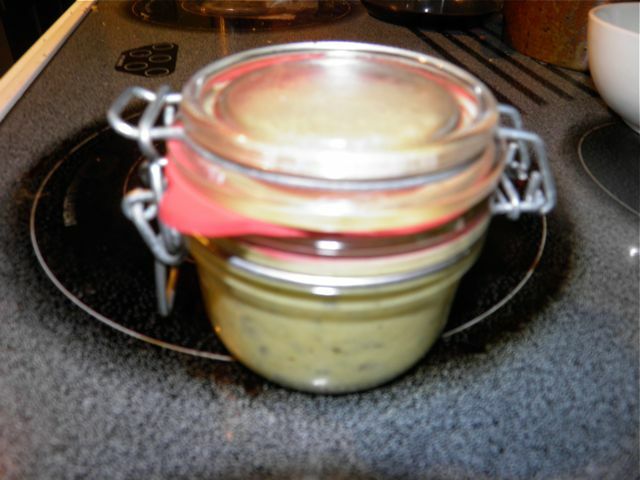 You can take the easy road and purchase a béarnaise sauce mix, but I find they are a different from homemade as night is to day. Of course, homemade wins hands down. The recipe has directions for using fresh tarragon and tarragon vinegar, or dried and white vinegar. Take your pick. Either method is perfectly acceptable and will give you a stellar result. I was going to post how to make tarragon vinegar at home as part of this, but will do a post on vinegars later. They warrant special attention. Tarragon vinegar also takes over a month to infuse, and the steak's on sale this week! This recipe makes enough for four generous servings on steak. Since there's only two of us, I refrigerated the rest. We'll use it this week on fish. Combine all ingredients except for eggs and butter in a saucepan. Cook until the liquid has been reduced by half. Allow to cool slightly. At this point you can strain to remove the solids if you wish. I do not, so I guess mine is "country" béarnaise. The leftover sauce, ready for another day. Over low heat, whisk 1 egg yolk into the reduction and then 1/4 cup of the butter. Alternate yolks and butter until all is incorporated. You may not need the final yolk. If the sauce doesn't resemble the consistency of hollandaise use the final yolk. Continue to whisk. When the sauce is thick, springy and light yellow remove from the heat. Whisk for 1 minute more. 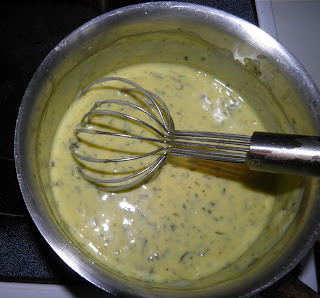 Note: if your Béarnaise breaks (butter comes out of the sauce) you can save it by whisking in a few drops of cold water. Use on broiled steak, fish dishes or egg dishes.